The light it takes, designed to solve. In our spaces, omnipresent, also close to our way of being. Our light has an identity. It is recognizable. Beauty is a subjective thing. We make what we like. And others might like it too. If beauty is a subjective thing, perfection is not. This is the summary of our success. Handled with humility, with respect and commitment towards our clients. Catellani & Smith’ creations are loved, in the world. Catellani & Smith was born. 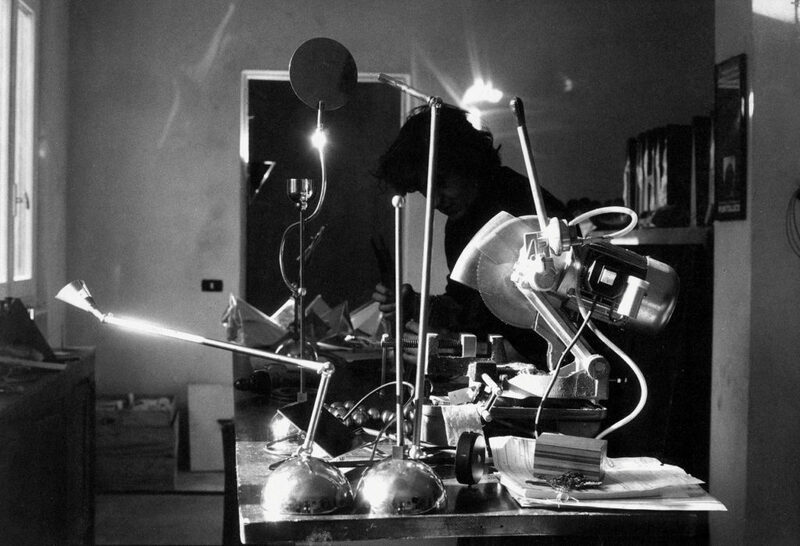 With Turciù” and “Albero della Luce” Enzo Catellani starts his adventure creating and producing lights shown in his first catalogue “Oggetti senza tempo”, primarily highlighting the possibility of interaction with the lamp as the object-subject. With the collection “Luci d’Oro”, the main theme is a reflection about the colour of light: the golden light of the sun and the fire; warm lights where the concept of refraction starts to take shape. 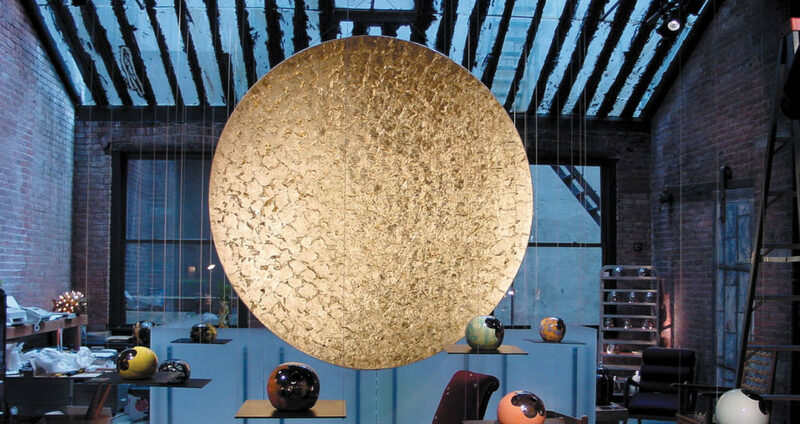 Luci d’Oro installation for Dilmos show-room in Milan, with rough iron colums lined internally with gold coloured leaf. The limited edition of the “Sogni d’Oro” (“golden dreams”) bed is presented to the public; one of them was purchased by the artist Claudio Baglioni. 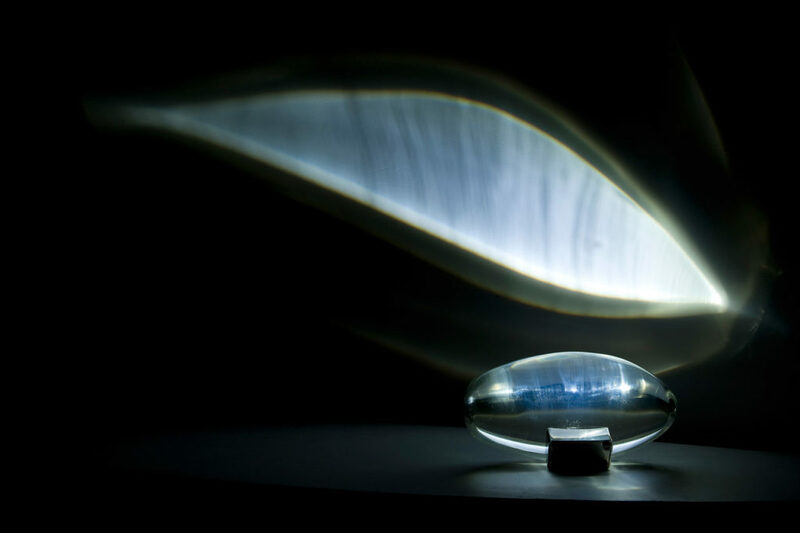 The new collection “Stchu-Moon” separates the light source from the illuminating object: the refraction of the light meets irregular surfaces crafted by hand and therefore unique and unrepeatable. 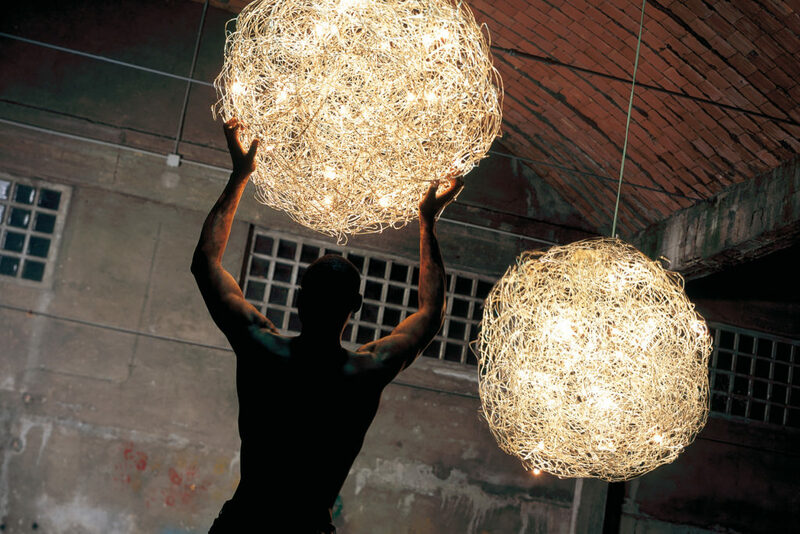 Enzo Catellani creates an “Albero della Luce” and donate it to the “Fondazione Museo del Design” of the Triennale in Milan. 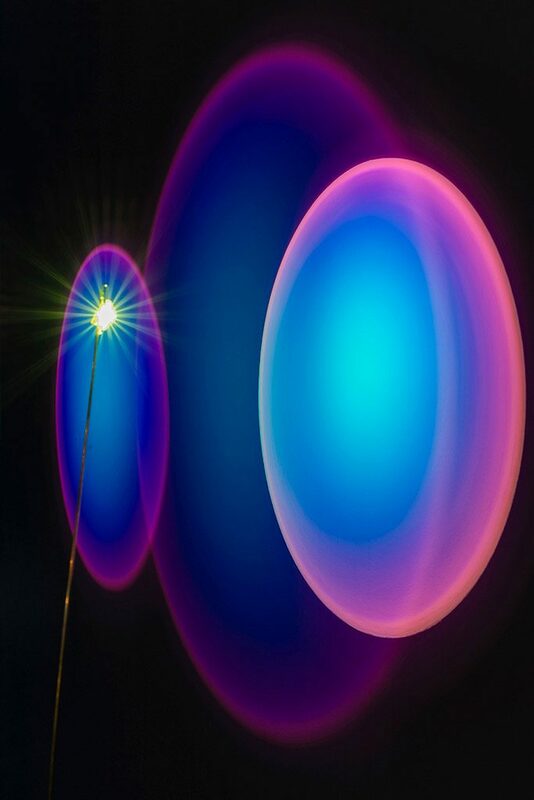 On the occasion of the “Designer’s Saturday – Licht im Raum” in Düsseldorf, Enzo Catellani makes experiments with the technique of the illumination of the water with a fiberglass hemisphere diameter 2 meters. 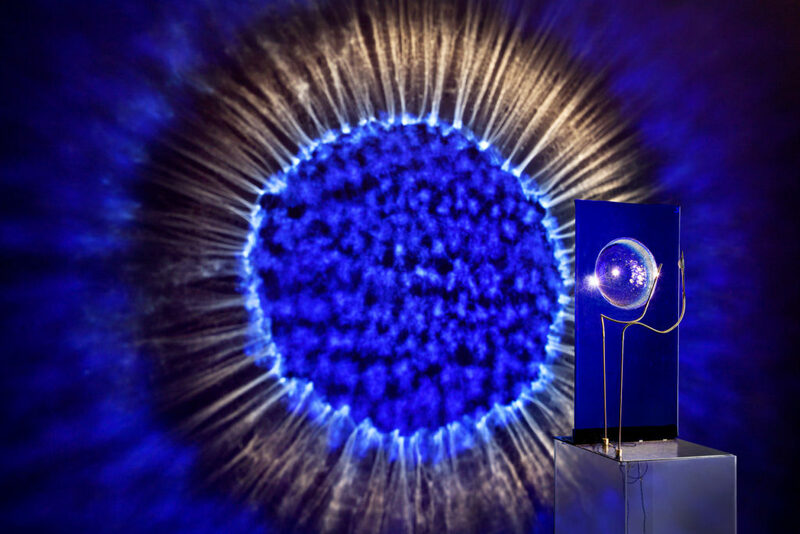 The low voltage bulbs are fully immersed in water, to generate moving light and beautiful effects of glowing. 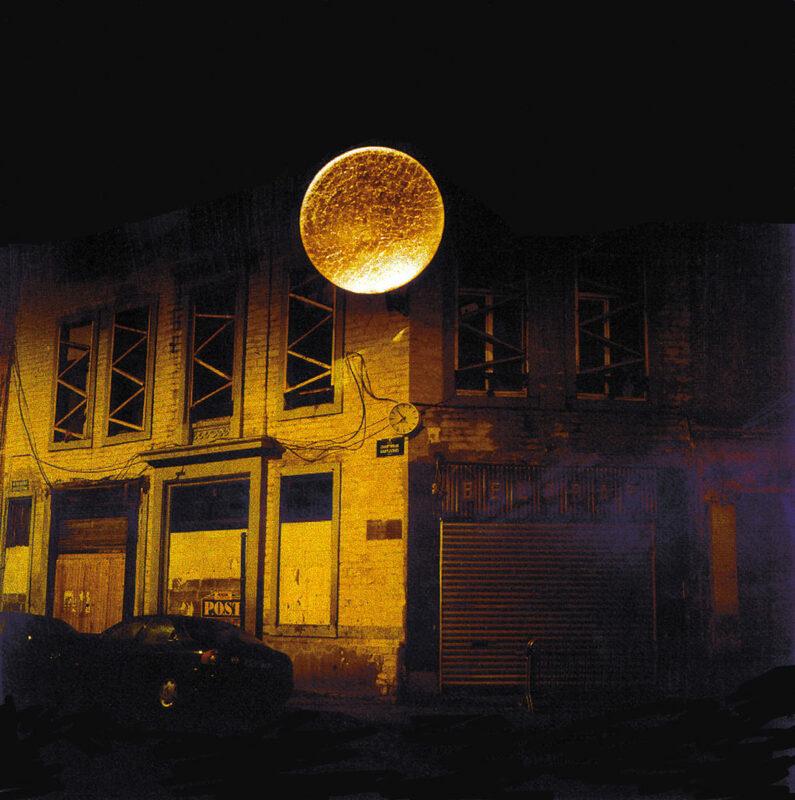 In Rue des Chartreux, Bruxelles is installed the first “Luna Piena Gigante”, a disc with a diameter of 2,5 meters completely lined with gold coloured leaf. Another piece installed in the same place is Albero della luce, 5 meters high, provided with 50 beams of optical fiber light. 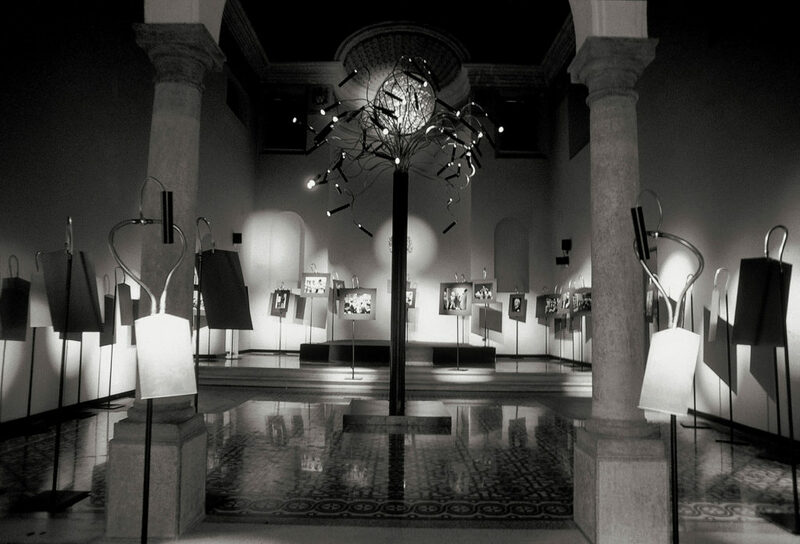 On the occasion of the “International Photomeeting”, as tribute to the photographer Larry Burrows, Enzo Catellani creates the “Albero della Lucenera”, 6 meters high with 50 beams of directional light emitted by black carbon directional tubes. 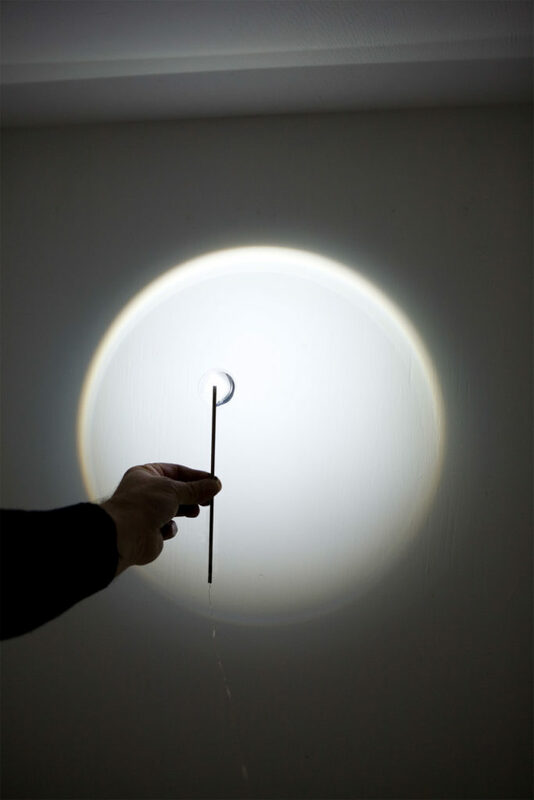 With “Lucenera” the process is inverted: the lamp sacrifices its “sculptural” value to leave space for the concept of “pure light”. The light source disappears making way for the illuminated subject. “Luci d’Oro” is presented in Tribeca, New York. 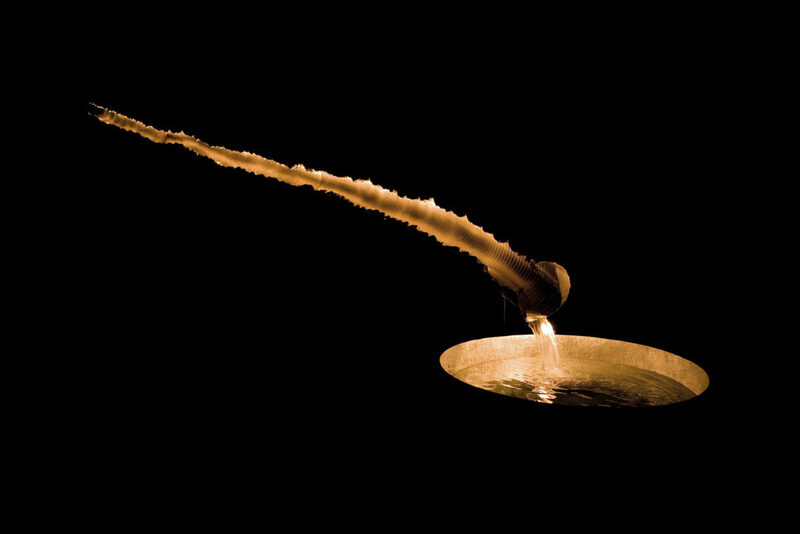 On the occasion of the fair “Abitare il Tempo” in Verona, Enzo Catellani presents Moon River, an out of collection creation: a river of aluminum supported by iron bases lets a stream of water flow, to be collected at its mouth by a large “Luna nel Pozzo”. “Out Collection” comes to life, grouping together prototypes and concepts not included in any other collection. “Fil de Fer”, “Luna nel Pozzo”, “Luce che Dipinge”, made in limited series, now go into production. 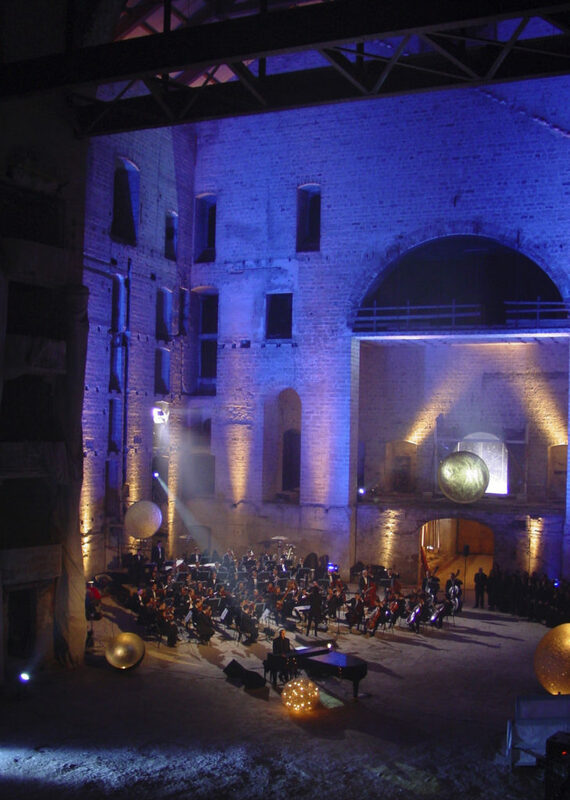 Upon request of the artist Claudio Baglioni, Enzo Catellani sets up in Lampedusa the scenery for the “’O Scia” event. Together with the director Pepi Morgia he also takes care of the scenery for Baglioni’s concert at Teatro Petruzzelli in Bari. 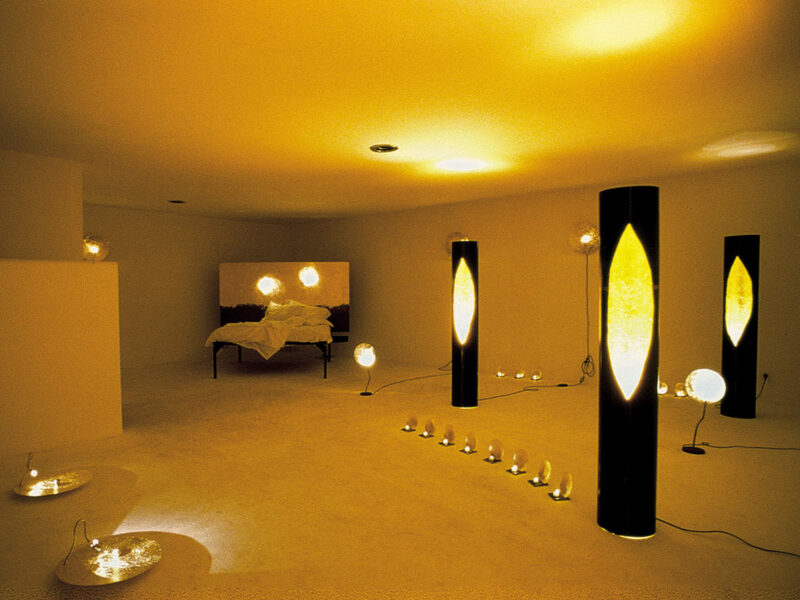 A change of colour with “PostKrisi”, lamps in fiberglass in which light interacts with colour and shape in an interplay of transparencies and contrasts. 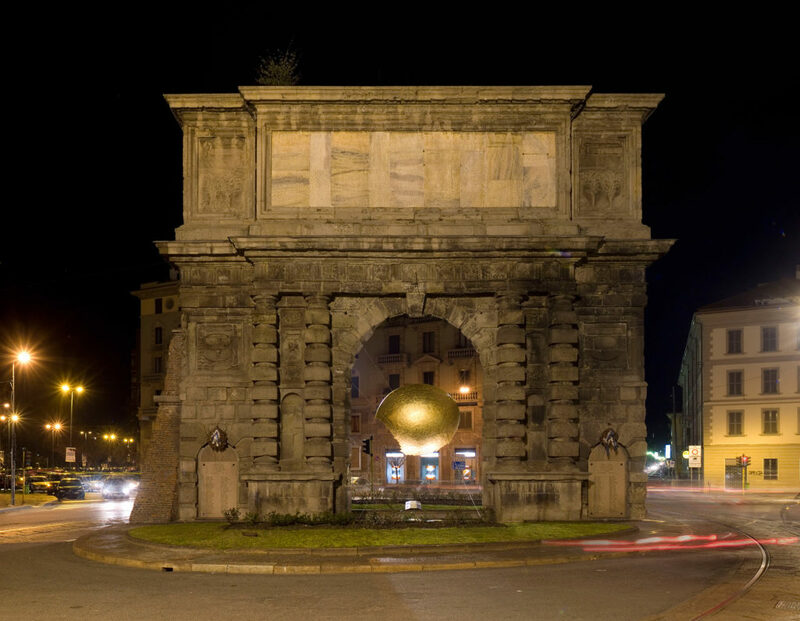 Gilda Bojardi, director of the magazine Interni, asks Enzo Catellani to create a work to be installed in Milan: the result is “La sfera incompiuta”, the unfinished spheres, 3 meters in diameter, made of exploded fiberglass, lined with gold coloured leaf outside and with silver coloured leaf inside, installed under the arc of Porta Romana, to light it for the whole duration of the events related to the fair Salone del Mobile. 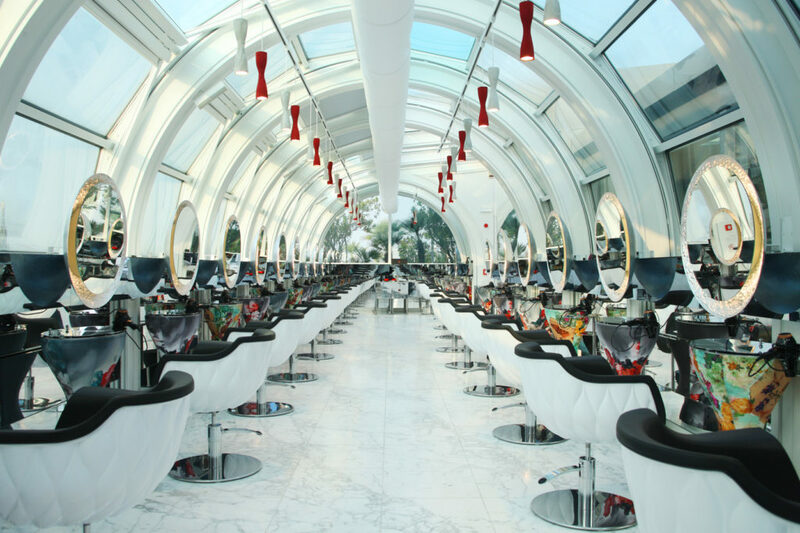 In the space of Doriana and Massimiliano Fuksas and Mimmo Paladino, Enzo Catellani illuminates a collection of decorative objects and contemporary jewelry by large fiberglass domes. 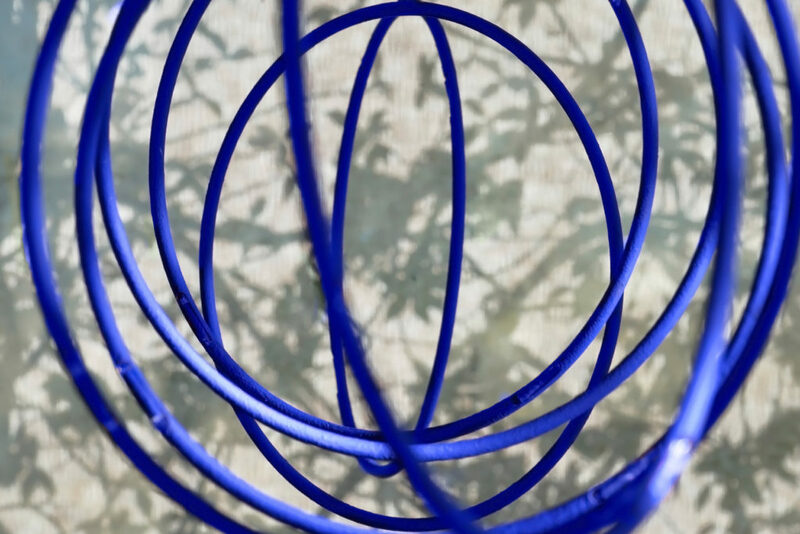 In the gardens of the Triennale is installed a permanent version of “Fil de Fer” with a diameter of 3 meters manufactured with almost 22.000 meters of aluminum wire with a total weight of 350 kg. 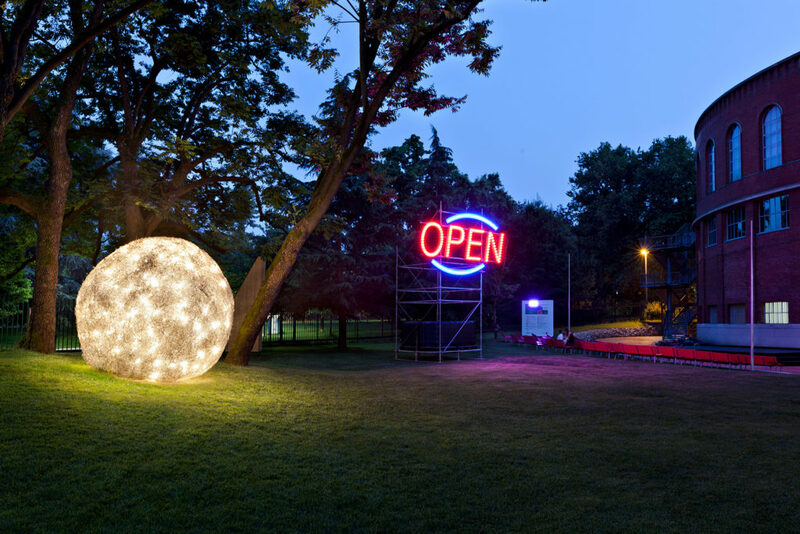 It is lit up by 400 bulbs (nowadays LED ones) creating the visual and emotional impact of a fallen cosmos. ©V&A Images/Victoria and Albert Museum/Galleries 12 to 16, Morris, Gamble and Poynter Rooms/Designed by MUMA/Lighting by Catellani And Smith / The restaurant-cafeteria of the prestigious Victoria & Albert Museum in London, the largest art and design museum in the world, is illuminated by 4 special Fil de Fer lights with a diameter of 2 metres, perfectly fitting into the style of the museum, which is characterized by modern design and quality craftsmanship. 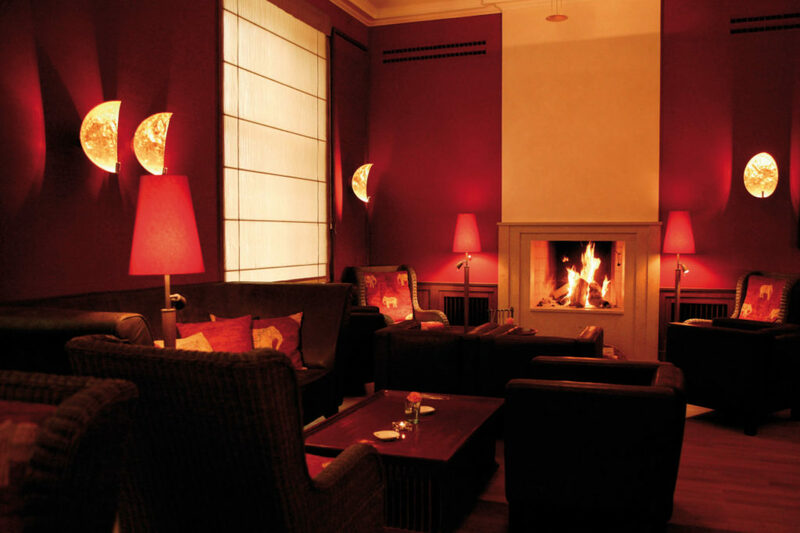 Catellani & Smith lamps from the Stchu-Moon, Luci D’Oro, Fil de Fer collections illuminates the main spaces of Schloss Elmau, a unique Hotel & Spa resort situated in an enchanting mountain setting among the Bavarian Alps, 100 km from Munich. 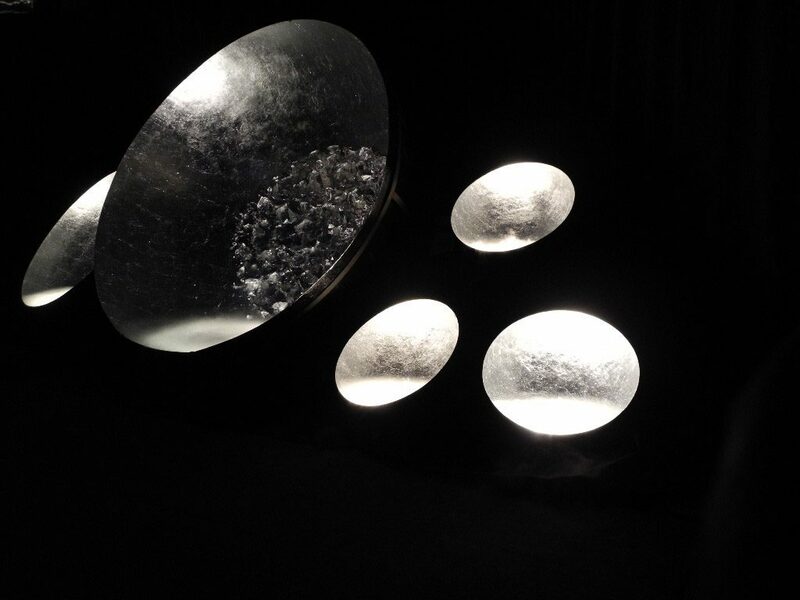 On the occasion of Fuori Salone, “Casa della Luce” is lit up by “Atman”, a magical oval object made in pure crystal, whose steel base hides only one LED. “Atman” is a trail of sensations originating while travelling in India. Enzo Catellani spent a dark and grave period of his life with his mind and eyes full of a light that came from nothing, never abandoning him, and that he tried to make palpable and real. Atman has become light and with it the intention of travelling backwards to rediscover the initial instinct of doing, for the pleasure of creating. Enzo Catellani is the guest of honor at “Habitat-Jardin” In Lausanne (Switzerland): the doors of Casa del Mago (House of the Magician) reopen. 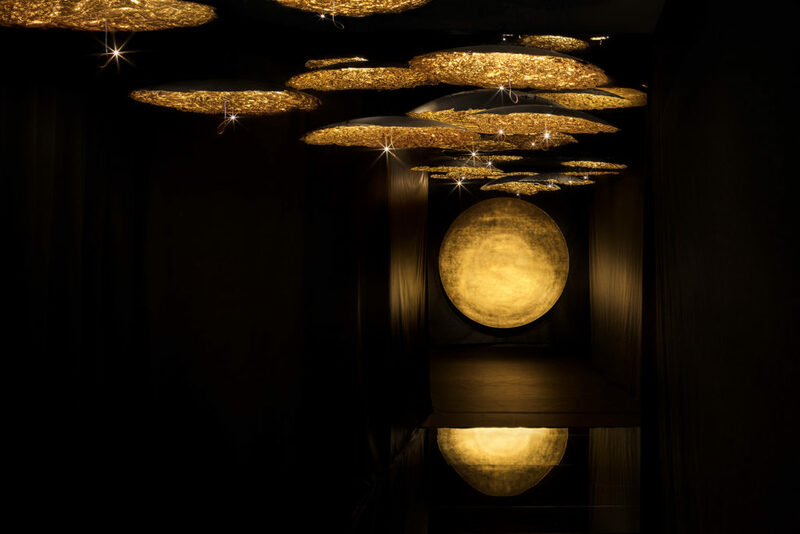 The name of the installation evocates the suggestive effects created by the installation of several scenic lamps, such as Moon River and the enchanting Luna nel Pozzo. With “Eco-Logic Light” the magic of LED light shows up. 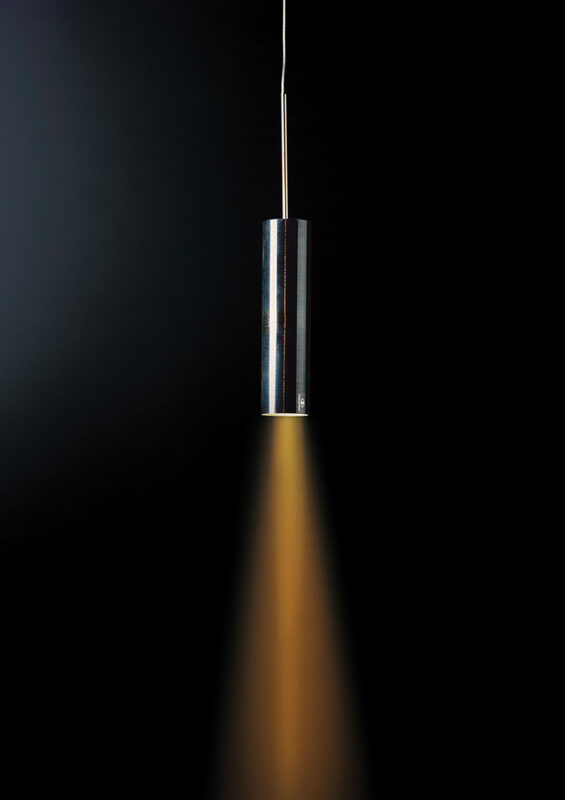 This new invention enables to create an item with a poetic-aesthetic value, which can however give off the same light as the old light bulbs and thus enabling to make use of the concept of light from refraction, ever present in C&S recent works, added to the fact that LEDs do not require maintenance and replacement and last almost indefinitely if produced to high professional standards. Patrimoni Mundial (UNESCO) Barcelona, 2008 ​arch. Antonio Gaudı̀. The interiors of this real wonder of Spanish Modernism – built between 1904 and 1906 – have been illuminated by the prestigious creations of Catellani & Smith, that has decorated the noble floor, former residence of the Batlló family, with a “Macchina della Luce”, a sculpture-like suspension lamp that integrates perfectly with the golden colour that dominates the space. The wall lamps of “PostKrisi” collection, on the contrary, seem to capture light and shape its shadows, with a charming interplay between transparencies and contrasts. 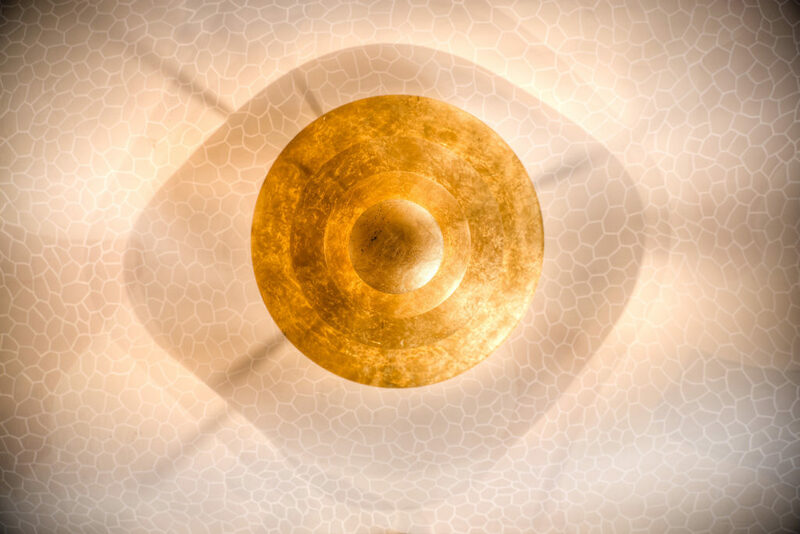 “Bella” wall lamps complete the selection made for Casa Batllò:this lamp, created between the 80s and the 90s by Enzo Catellani, it is now covered with gold coloured leaf, to represent the most classic Catellani & Smith style. The former Neveri convent in Bariano, in the province of Bergamo, is one of the best preserved buildings of its kind. It stands on the site of the old Roman settlement of Vicus Aberga, parts of which have survived to this day. 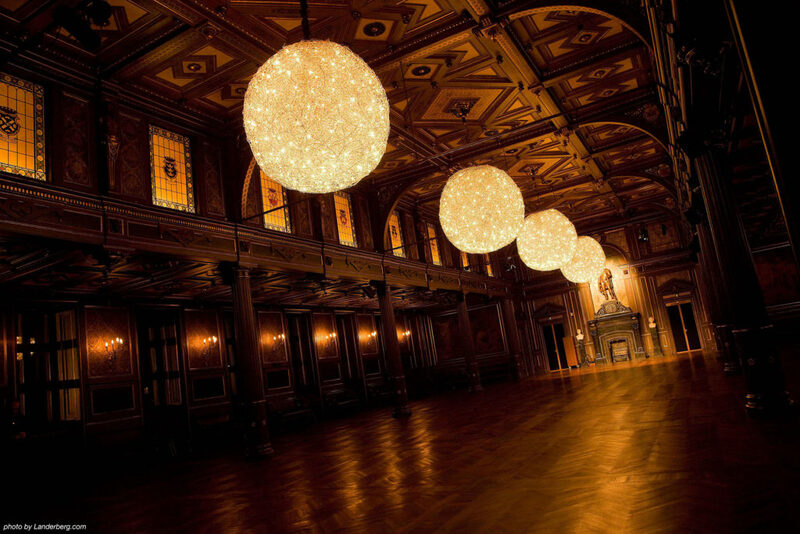 The desire to integrate the latest in technology into a building of such historical importance influenced the decision to choose exclusively LED light sources and equipment with linear and essential lines, which generate a subdued but efficient luminosity and at the same time highlight the historical and architectural character of the building without disturbing users with overly bright lamps or light sources. The result is a magical atmosphere that touches the sensitivity of the user. 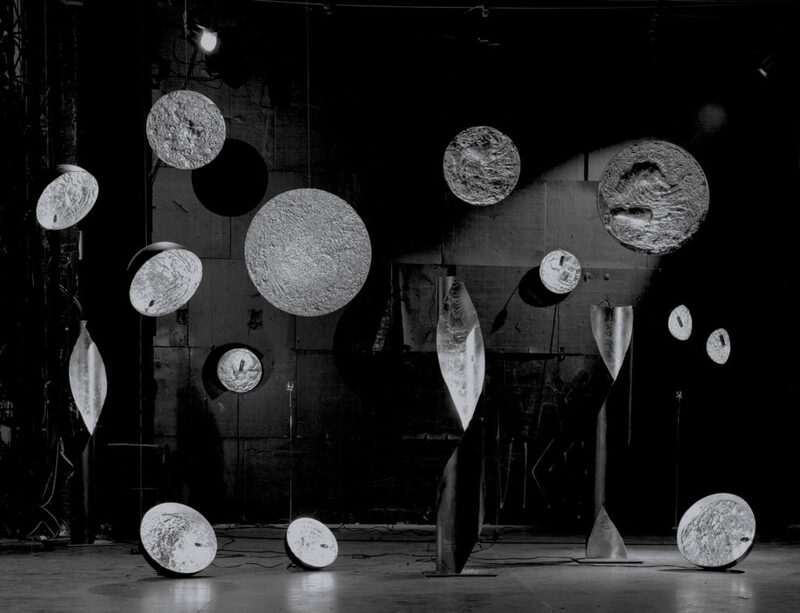 At the Triennale di Milan for the exhibition “Triennale Serie Fuori Serie” appears an enormous skein of aluminum wire bearing a myriad of luminous points. 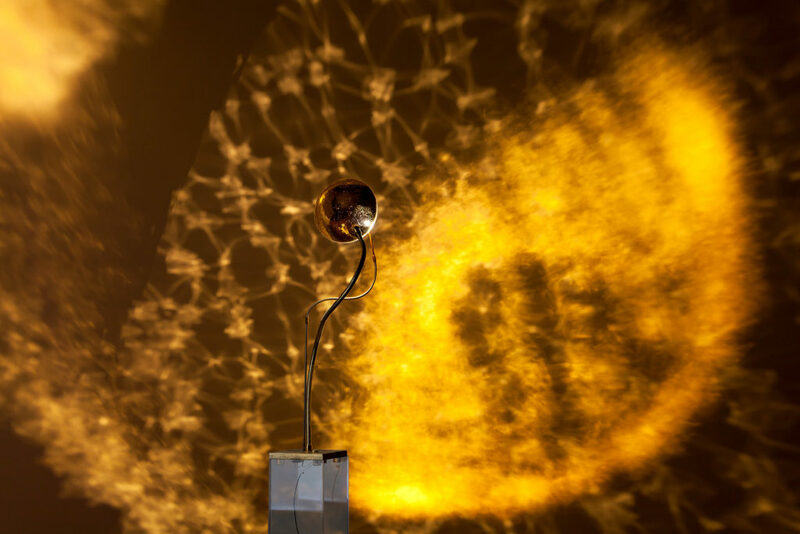 A “cosmic” lamp and possible model of the universe. 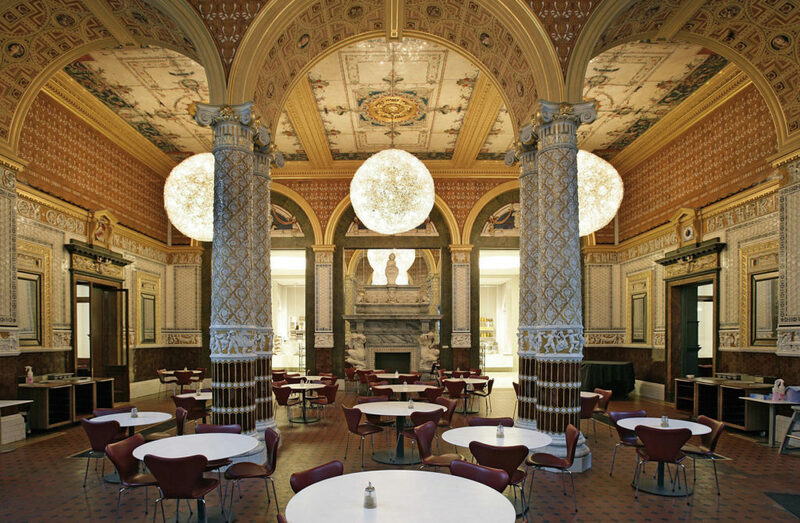 Catellani & Smith collaborates in the replacement of the original light fittings in the Exchange Hall, providing 4 custom-made Fil de Fer lights with a diameter of 200 cm. The hall was the vital centre of the Stock Exchange where all types of goods were exchanged; today it is hired out for conferences and events. 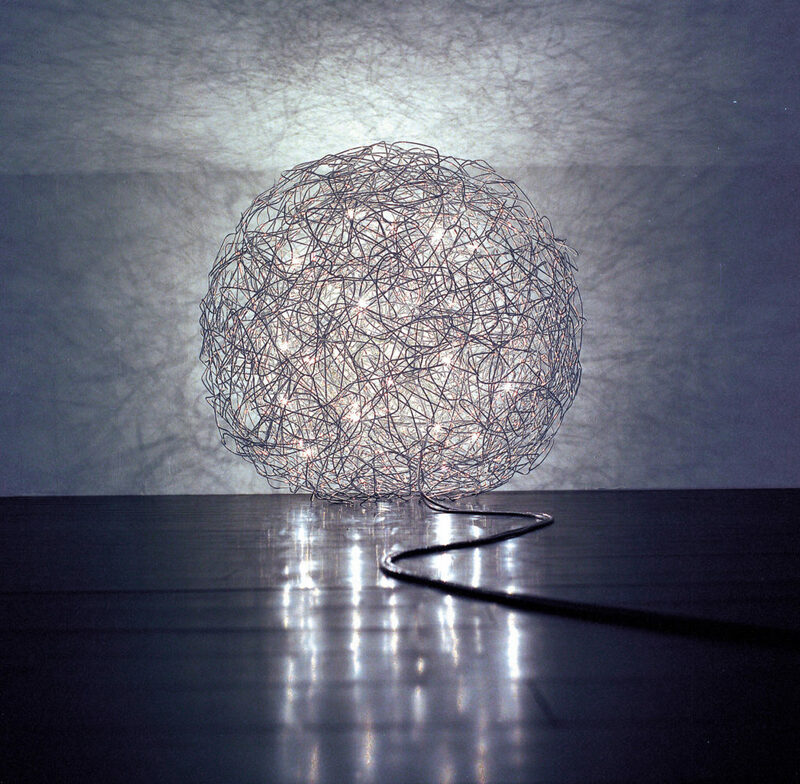 One of his most famous lamps in the world, Fil de Fer, is selected as an example of excellence “made in Italy”, to be exhibited in the Italian Pavilion at the World Expo Shanghai 2010. 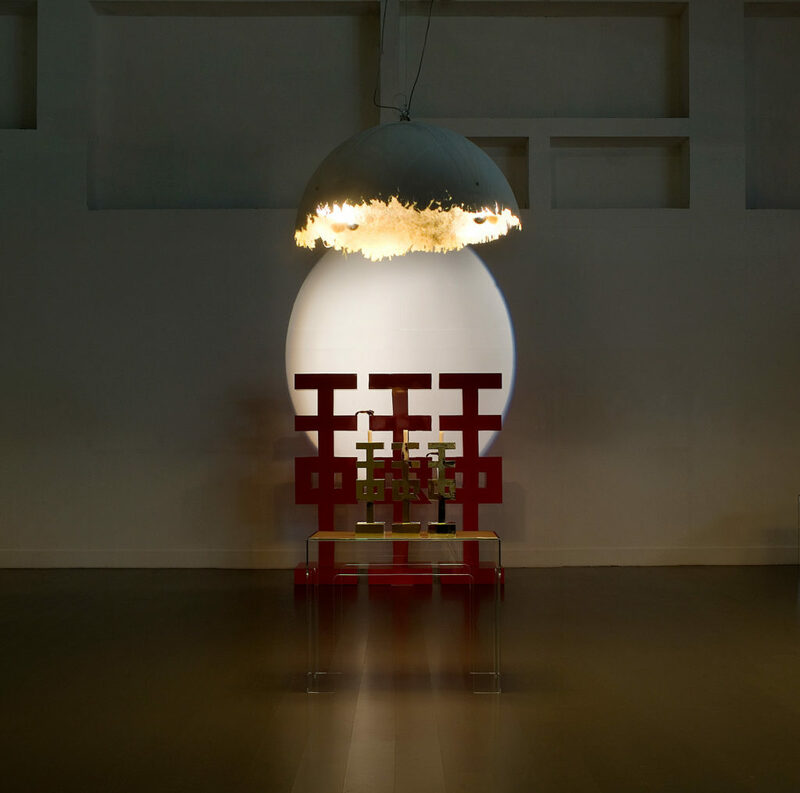 This floor lamp will be permanently housed in the museum, which is still under construction in Shanghai. Enzo Catellani is guest of honor at an event held in St. Petersburg, where he presents the Eco-Logic Light collection, in the presence of numerous journalists, representatives of the most important magazines specialized in design and furniture, and of some Russian televisions’ reporters. 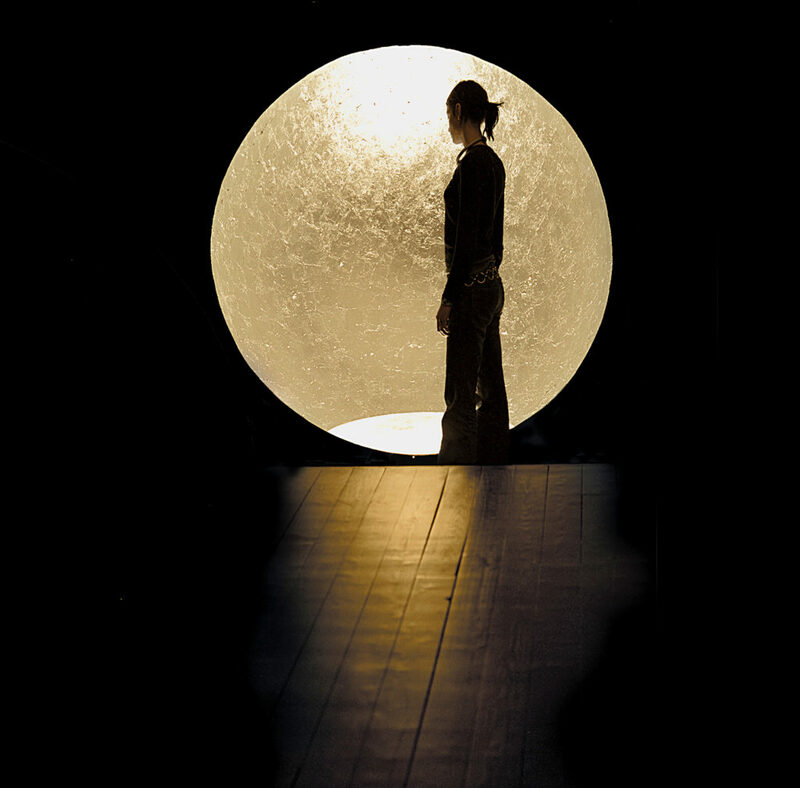 An event dedicated the work of Enzo Catellani takes place in Singapore. 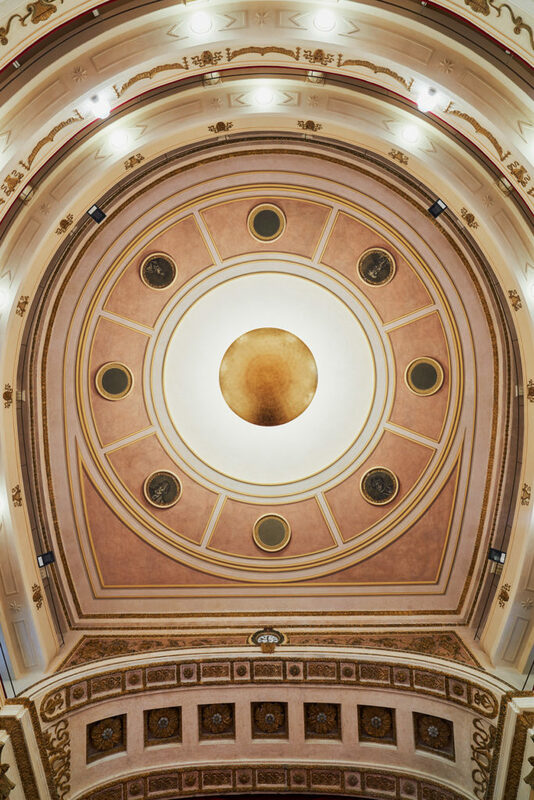 In the frame of an old theater located in the heart of the city, he retraced all the extraordinary collections of Catellani & Smith until Sorry Giotto, which has been just created and has already won important awards. Enzo Catellani takes part in events in Taipei and Hong Kong, always as a guest of honor. 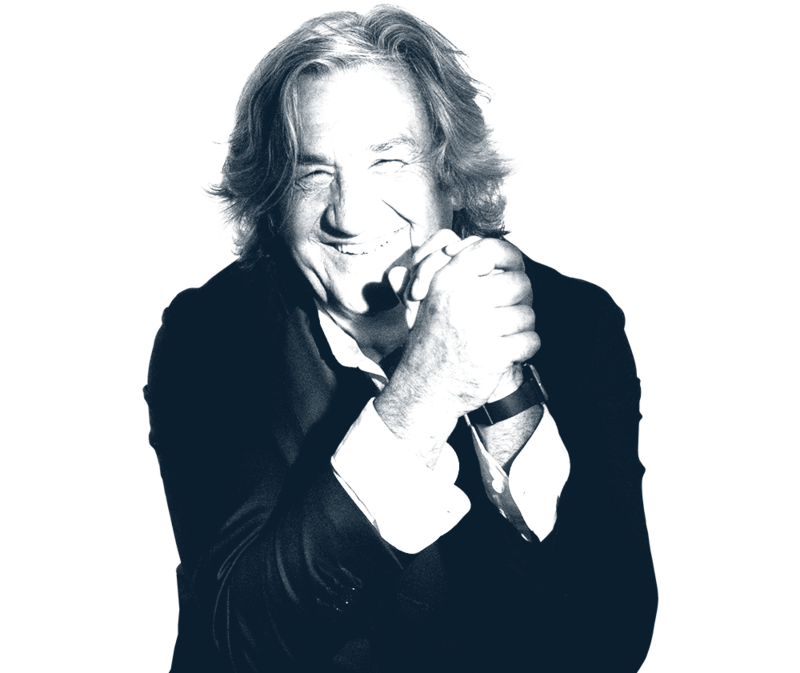 His lights have often been required for the scenography of movies and picture shows, as well as being purchased by many representatives of the Italian and foreign show business and published by the most prestigious international interior design magazines. Glass/Wood House / New Canaan, Connecticut. Kengo Kuma Associates and Susan Leaming (Architectural lx) work to restore an icon home from the 19050s in New Canaan, building a new wing, which could maintain the original grandeur and harmony with nature. 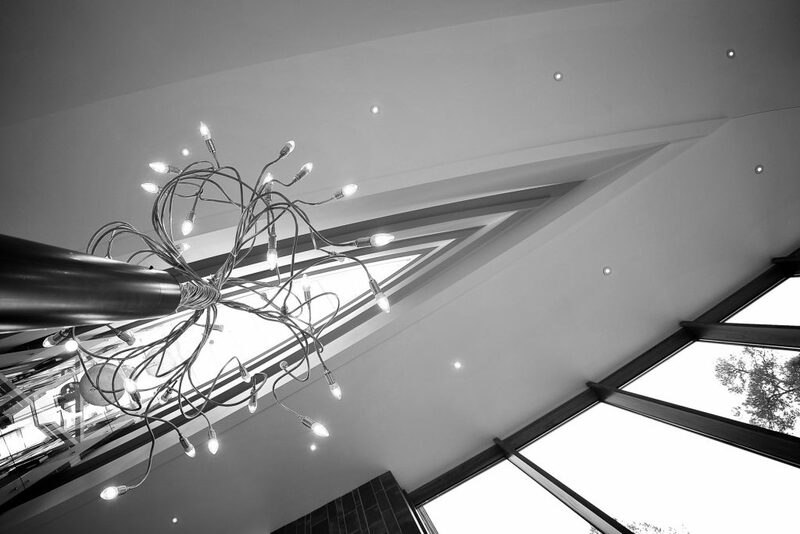 A custom Light Stick ceiling lamp lights up the table in the dining room of this new glass and wood structure. 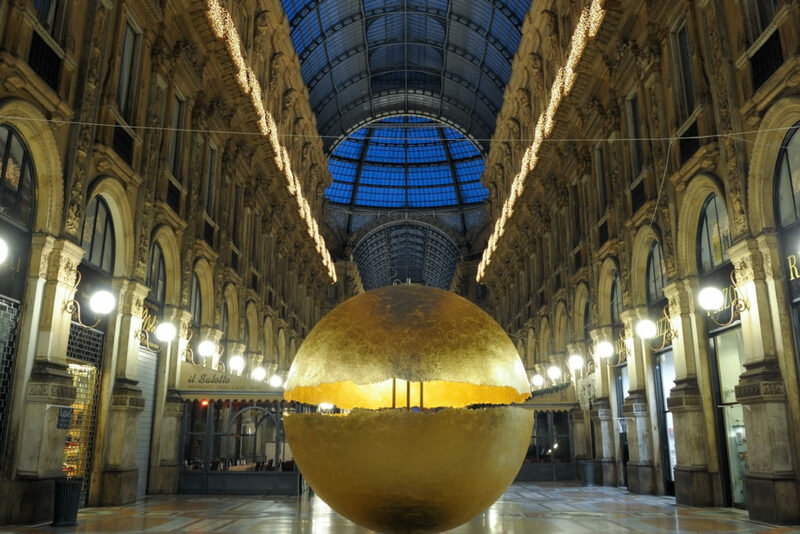 “PostKrisi” installation at the Galleria Vittorio Emanuele in Milan. 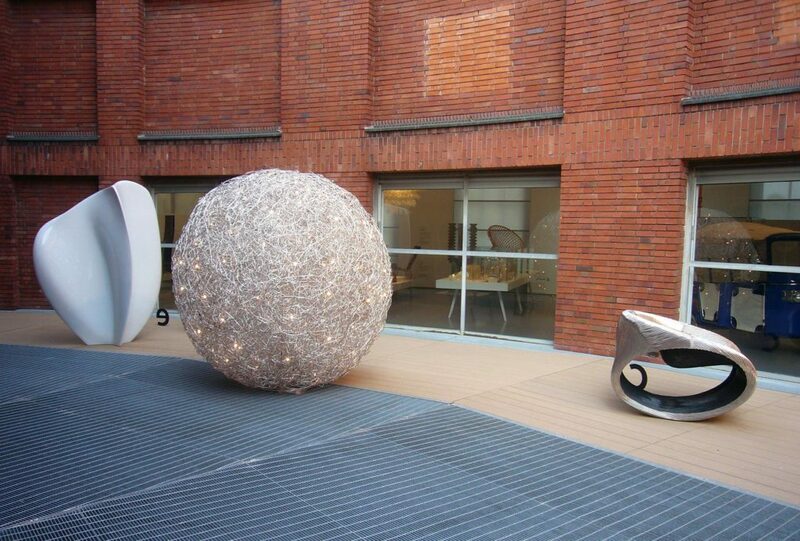 A big sphere lying on the ground, luminous and massive, completely covered with gold coloured leaf. A mix of ancient value and modern technology. 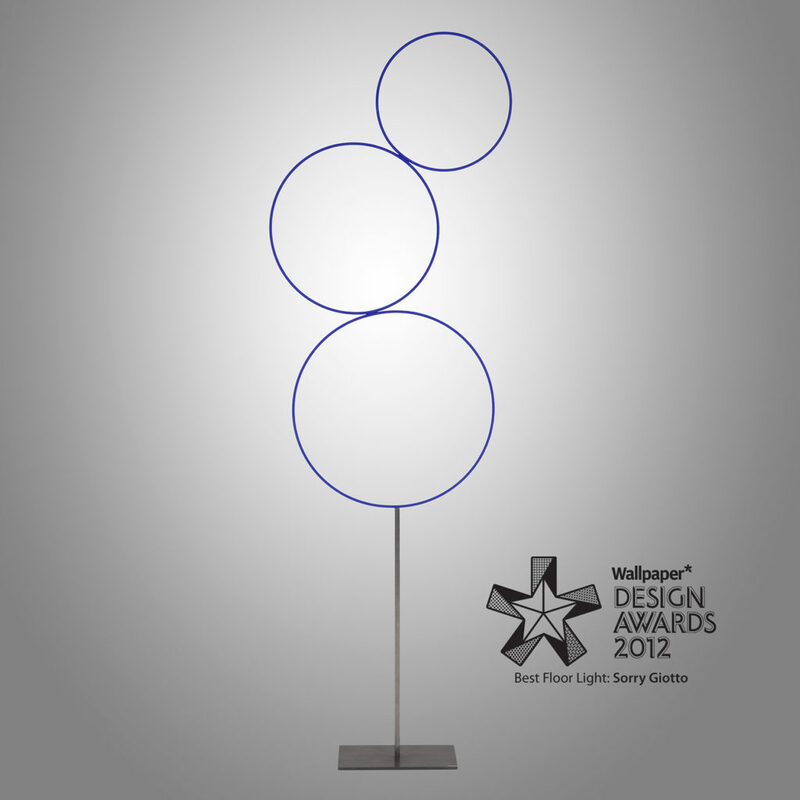 “Sorry Giotto” is awarded in London with the prestigious “Wall Paper Award”. 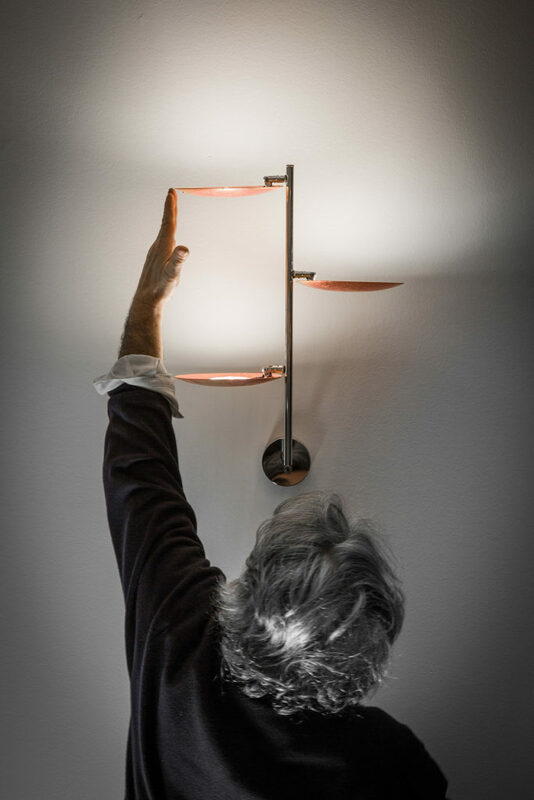 “Lederam” is the latest evolution of “Eco-Logic Light”: its name combines the LED technology with a new copper coloured leaf finish. The discs with their soft, warm colour enclosure a next-generation mains voltage LED-module. The collection is also available in different combinations of colours. 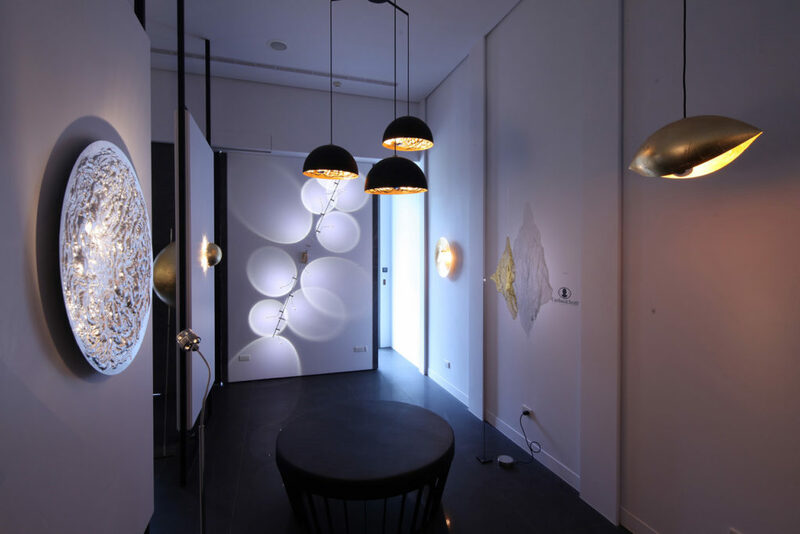 In cooperation with the architect Anton Kobrinetz, Catellani & Smith lights up Aldo Coppola’s new atelier “Kingdom of Beauty” in Corso Europa in Milan. 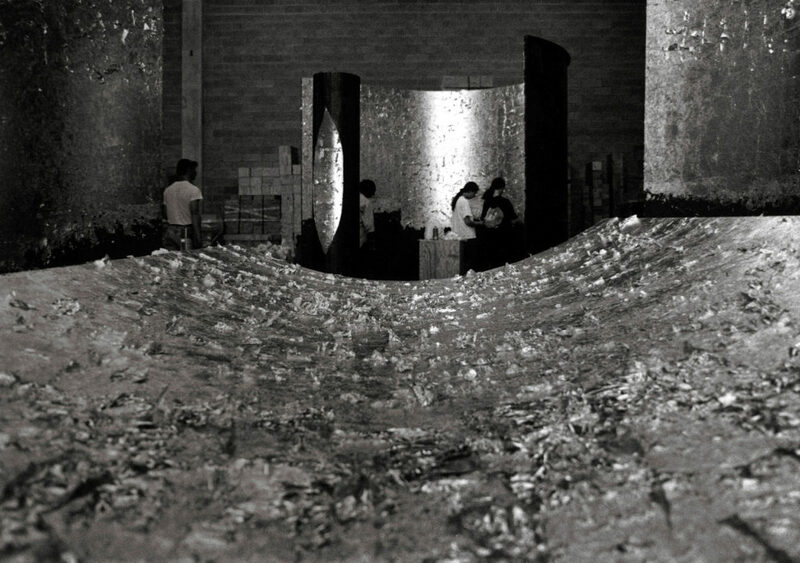 In conjunction with Expo Milano 2015, Enzo Catellani participated with a site-specific installation in “Alma Mater” by Yuval Avital, in dialogue with “Il Terzo Paradiso” by Michelangelo Pistoletto, at the Fabbrica del Vapore in Milan. Catellani & Smith takes part in “I Maestri del Paesaggio” (Masters of the Landscape), an event organized by Arketipos and devoted to landscape architecture, this year focused on the theme of “Feeding landscape”. On the occasion it presents some prototypes of the coming outdoor collection. 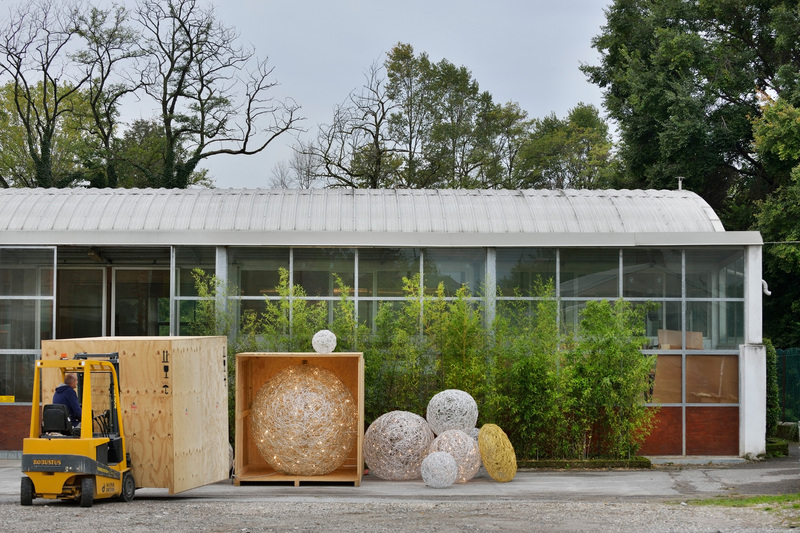 The new outdoor collection, enriched with additional models, is exhibited to the public during the “Maestri del Paesaggio” 2016 edition dedicated to the “Wild landscape”. During Fuori Salone in Milan, Catellani & Smith exhibits at “Casa della Luce” the light installation “Hallucinations”: intriguing light effects, obtained through a particularly refined and impeccable craftsmanship, make the ancient art of glass working still modern, thanks to the artistic collaboration with master glass-worker Giuliano Gaigher. The “Hallucinations” journey continues in New York, exhibited at ABC Home Gallery. Enzo Catellani participates in the exhibition “Day, Light, Night” held at the Istanbul Modern Museum with the installation “Shadow”, an artwork that interprets the magical shadows of sunset, performing it with a selection of colours, in contrast with the darkness of the night. 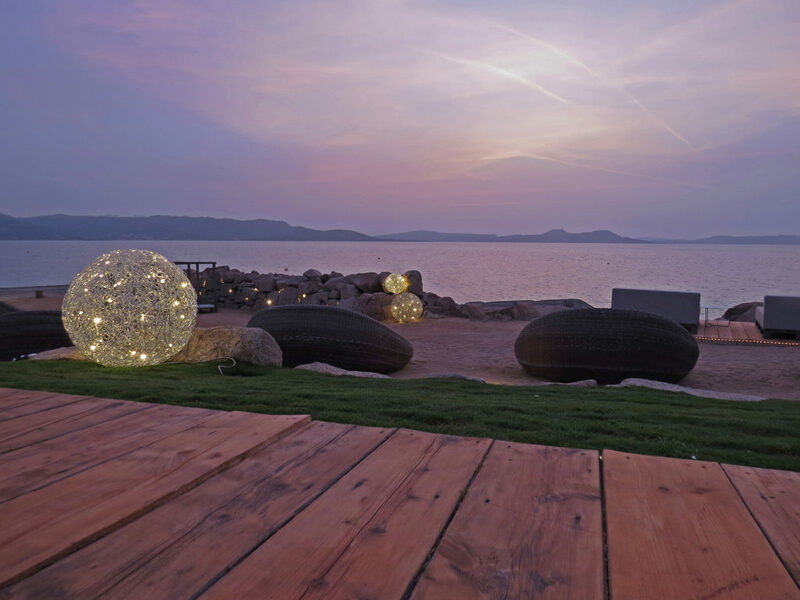 With its rare beauty and stunning surroundings, Phi Beach in Costa Smeralda, Sardinia, becomes the perfect location for the outdoor collection. Its breath-taking natural position offers every day the unique experience of one of the most beautiful sunsets in the world. 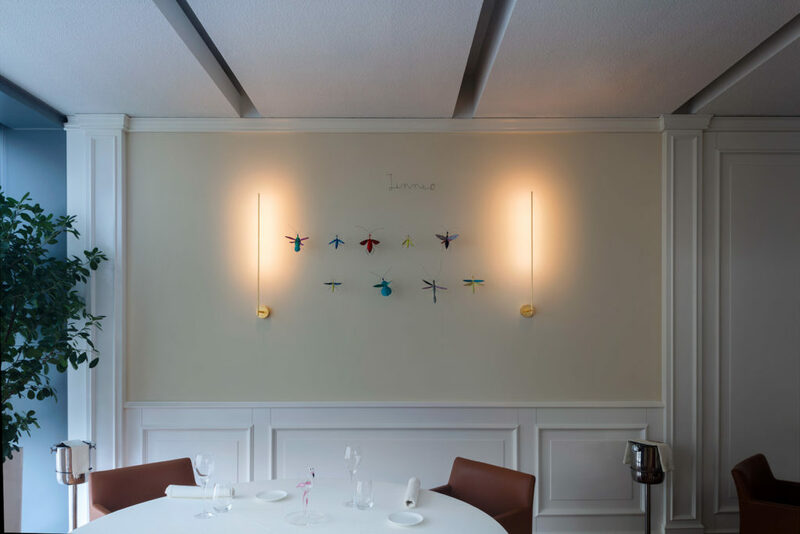 Catellani & Smith lighting products illuminate the new “Casual”, restaurant by Enrico Bartolini, the internationally renowned Michelin-starred chef. 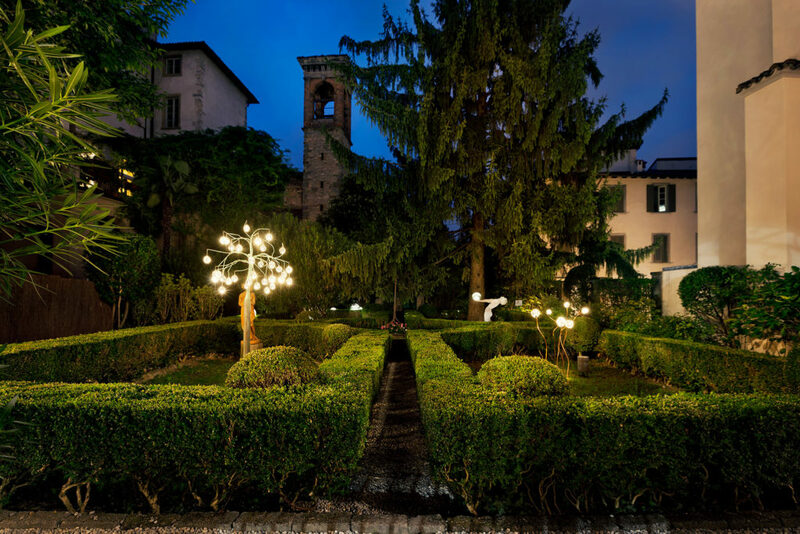 The “Casual Ristorante” is situated at the foot of the panoramic hill of San Vigilio , in the charming Upper Town of Bergamo surrounded by sixteenth-century Venetian walls, declared in 2017 Unesco World Heritage site. 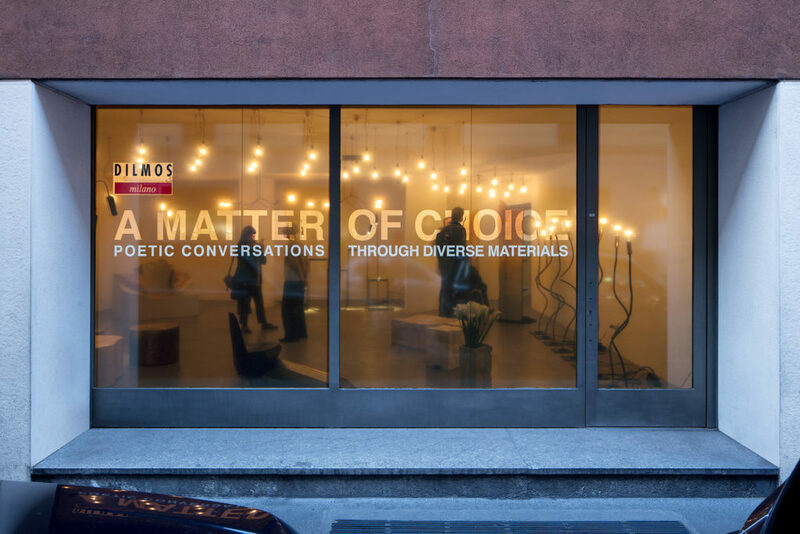 One of the most recent and important collaborations of the year is with the MUDEC Museum of Culture in Milan via Tortona, a lively place, particularly during Milan Design Week. 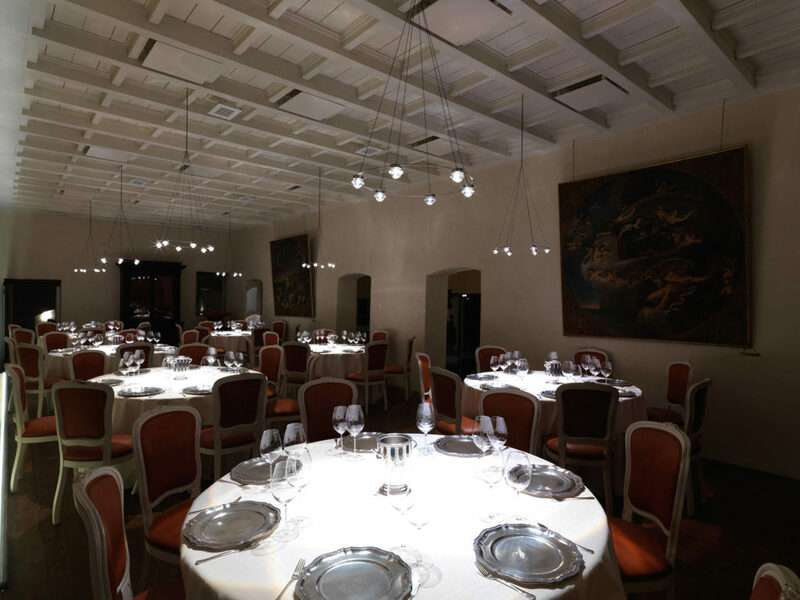 Catellani & Smith illuminates the museum’s restaurant, which is overseen by the multi-Michelin-starred chef Enrico Bartolini, with lamps from the “Light Stick” collection. These lights, thanks to their simplicity and sophistication and to the harmonious balance between light and shade, emphasize the pure, essential design of the wood panelling and white walls of the place. Catellani & Smith takes part to the ambitious restoration project of the “Teatro Sociale Camogli”, whose doors reopen after 40 years of inactivity, thanks to the work of Studio Berlucchi in Brescia and Arassociati in Milan, providing a series of lamps with an extraordinary scenic impact, such as the great golden disc that hides a lighting source by Light Contract, the company that has designed the whole lighting project of the theater. Catellani & Smith has found a home in the new Salvioni Milano Durini concept store, in via Durini 3, Milan. Designed by the architect Riccardo Rocchi, the show-room houses several display areas showing a selection of different living styles. 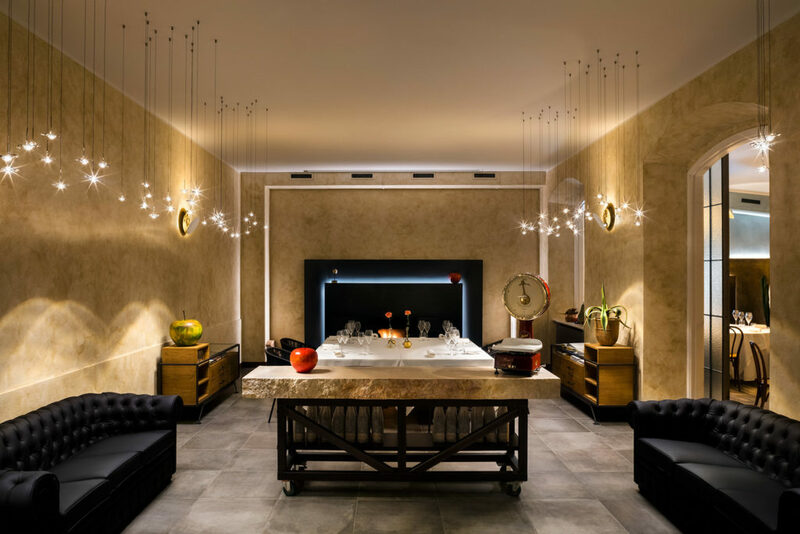 Catellani & Smith lamps, which have been installed in this evocative place, intervene in the conversation between the furnishings and spaces, creating harmony and filling the rooms with light. 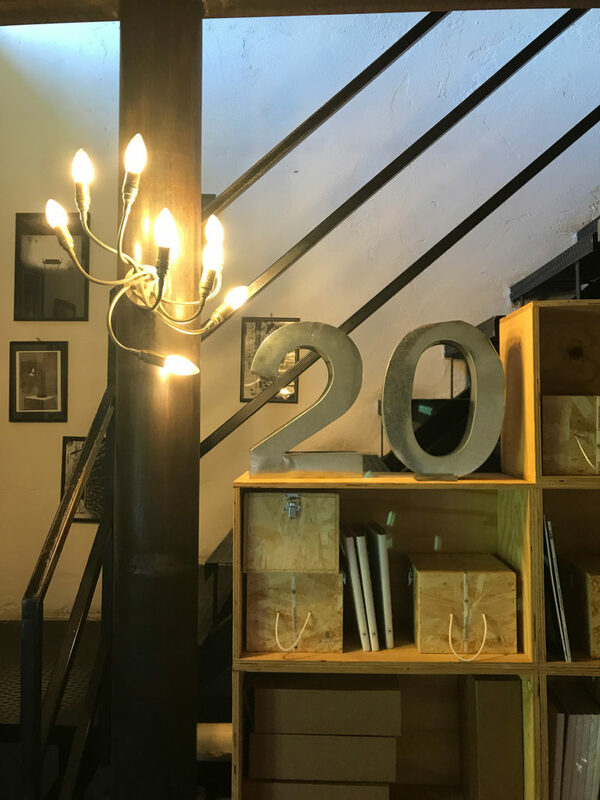 A standard version and a customized model, made especially for the new concept store according to the specific needs of the space, of one of Catellani & Smith most important creations is associated to each floor of the building. 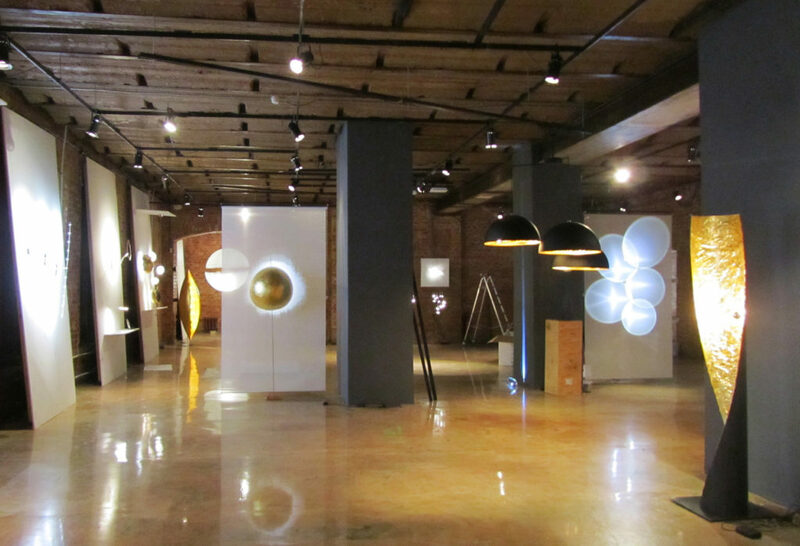 The “Lederam”, “Fil de Fer”, “Luci d’Oro”, “Stchu-Moon” and “Turciù” series are some of the collections present inside the Salvioni Milano Durini showroom. 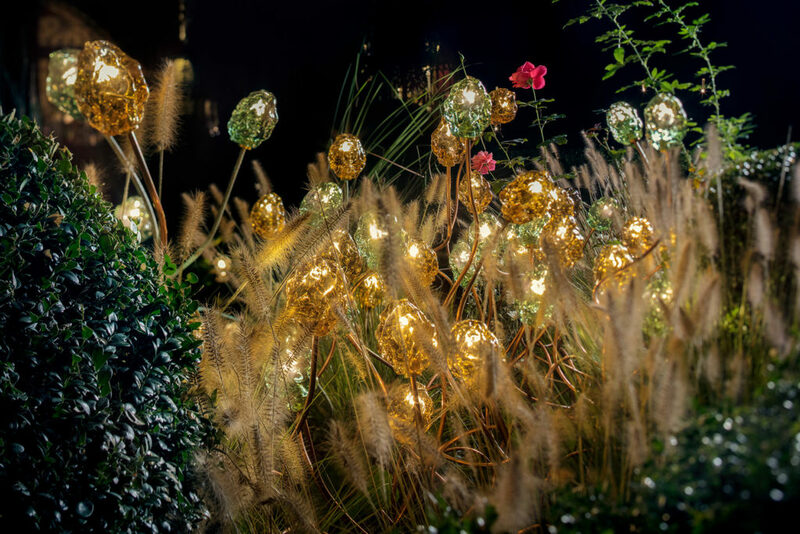 In addition to the products designed for indoor lighting, the outdoor collection is also present: the light sources of the spheres of the iconic Fil de Fer and the other new outdoor creations create a magical atmosphere on outdoor terraces and vertical gardens. 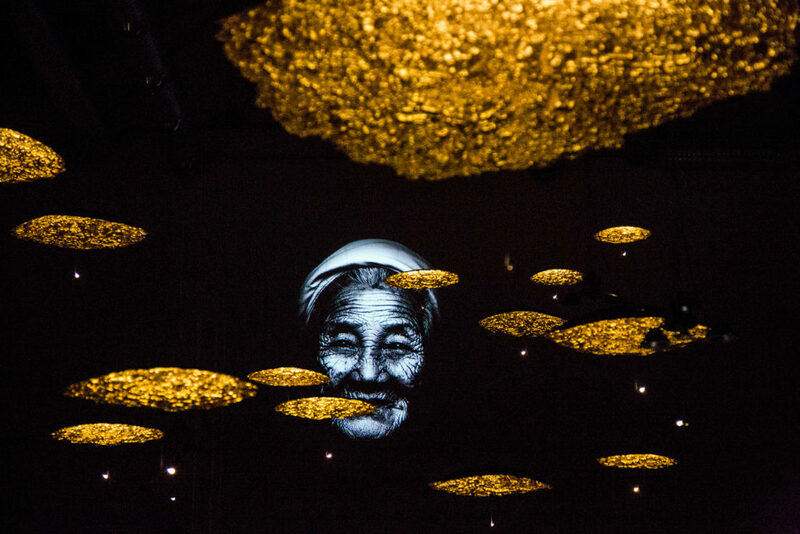 “Resonance” by Enzo Catellani is an emotional and immersive walk through lights and sounds, created by more than 50 discs of different size covered in gold coloured leaf and lit by micro LEDs, hanging at different heights. With this project for the Fuori Salone in Milan, Enzo Catellani creates a clever balance of music, light and shade: a fascinating atmosphere that fills the eyes of visitors with wonder and leads them in discovery of light, in a “new light”. 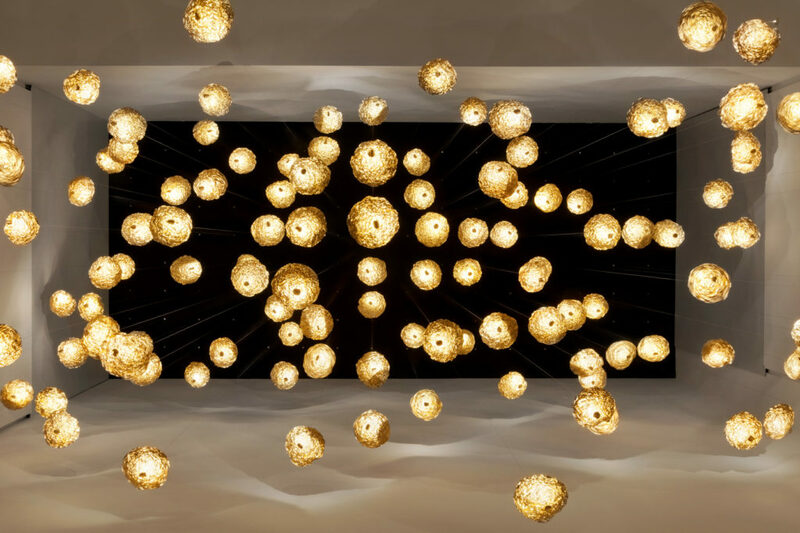 As happened in 2013 for the project of Kingdom of Beauty in Milan, the ateliers Aldo Coppola have selected once again Catellani & Smith’s lighting design for their first flagship store in Lugano. 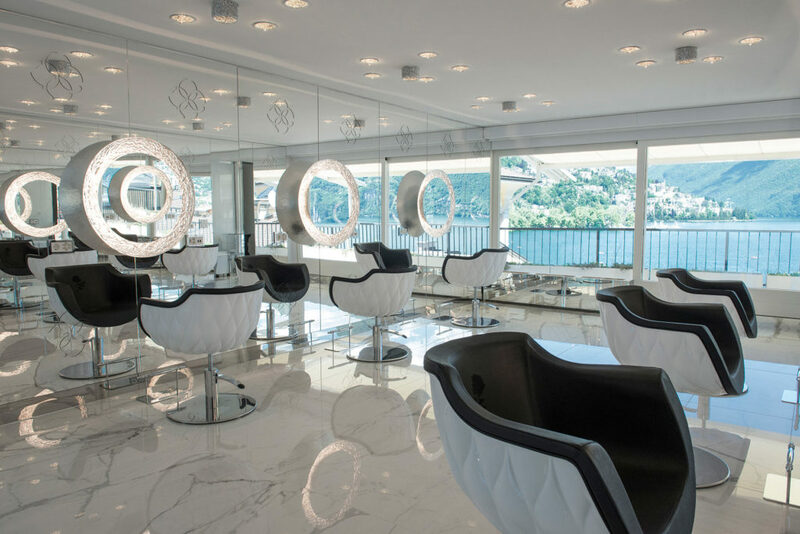 The new kingdom of beauty beyond the Alps was conceived from an idea by Aldo Coppola Jr and the expertise of the architect Anton Kobrinetz, to express a comprehensive concept of wellness, that includes exclusive treatments for hair and body care. 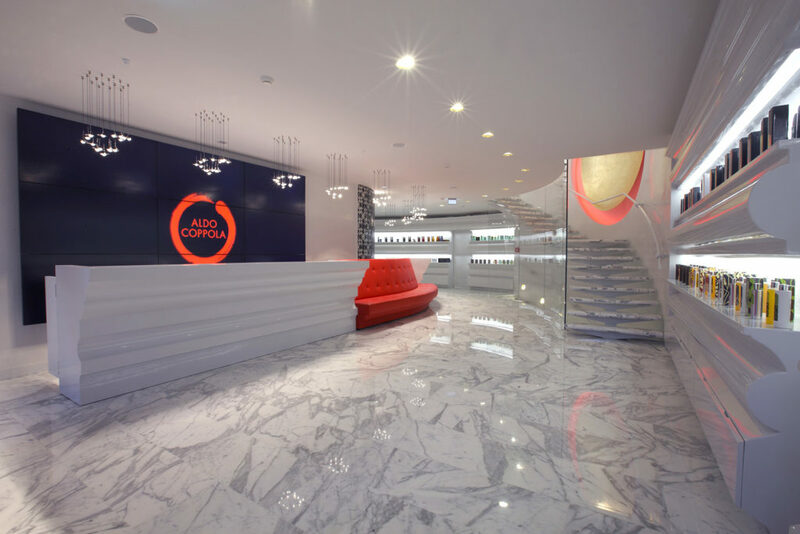 The collaboration with the Aldo Coppola Ateliers continues in Milan with the new shop at “La Rinascente” in a stunning location. 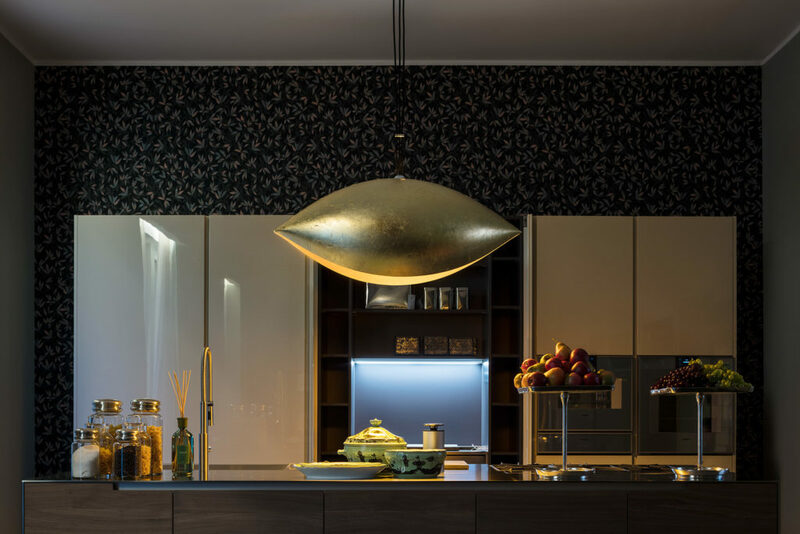 On this occasion, beyond some of the products installed in Lugano, a new suspension named “Dress My Beauty” has been designed together with the architect Anton Kobrinetz. 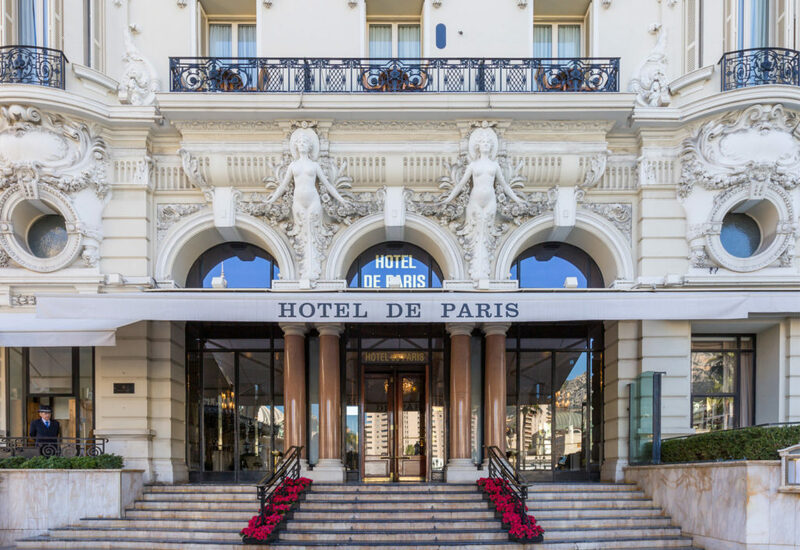 Catellani & Smith works with Hotel de Paris in Montecarlo, Principality of Monaco, to illuminate some restored key areas of one of the most prestigious Hotel in the world. 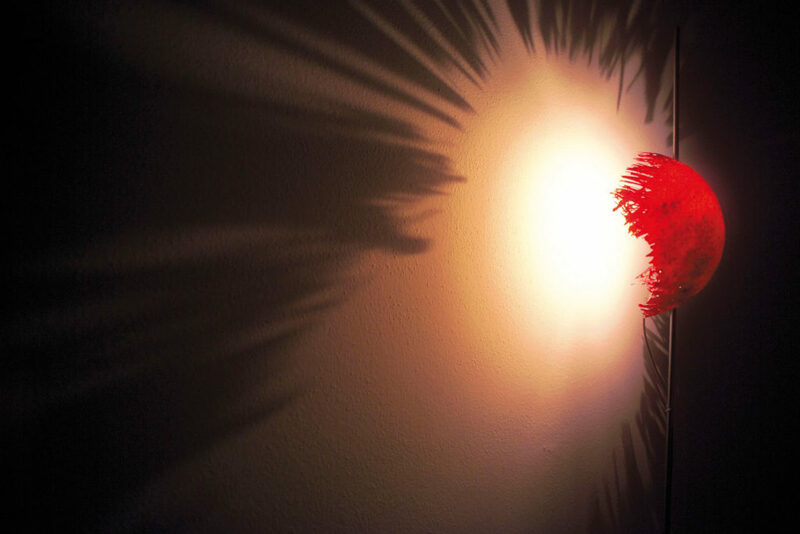 The lights chosen are an LED version of “Disco” and a custom model of “Luna LED” wall lamp. 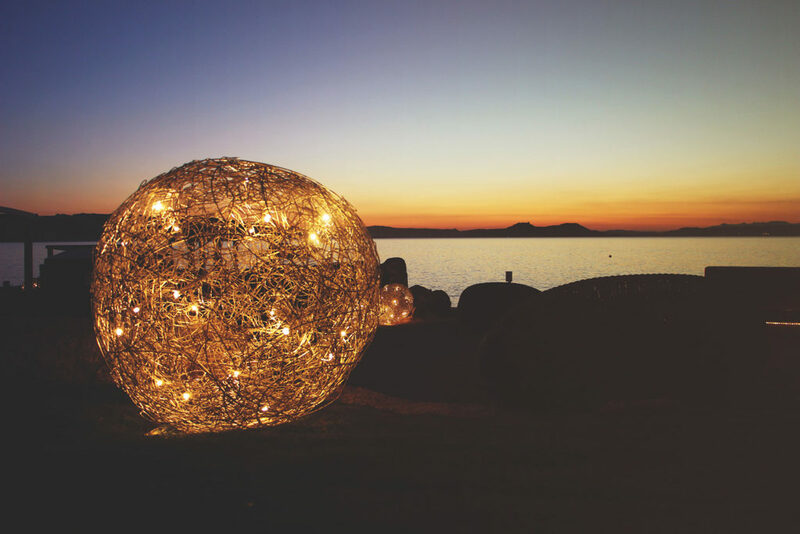 For the second season, Phi Beach in Costa Smeralda, Sardinia, hosts the lamps of the outdoor collection in a breath-taking and unique location.